during the previous 12 months. Good news for cancer patients who need a tooth extraction. Plasma-rich growth factor (PRGF) can aid in the surgical management of cancer patients on bisphosphonate therapy who require a tooth extraction, according to a new study in Oral Oncology. 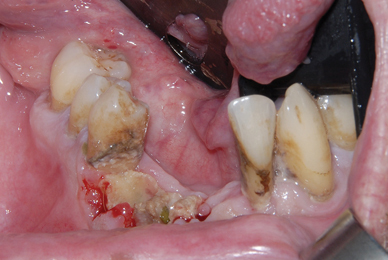 For cancer patients who undergo intravenous (IV) bisphosphonate therapy, dental extraction is the main cause of bisphosphonate-related osteonecrosis of the jaw (BRONJ), the researchers noted (Oral Onc, April 5, 2012). Managing these patients after surgery can be challenging. Often any surgical intervention is completed prior to IV Bisphosphonate use, but sometimes this is not always possible.